It’s rare that both Mateo and I have the same entire day off, let alone three days in a row! But it’s been happening lately, so we’ve been taking advantage of our time together to explore the area and towns around our house. This weekend (yes, we actually got a WEEKEND off at that!) we explored the Colli Euganei. The hills take their name from the Euganei, a semi-mythical population who inhabited the area before the Venetians. 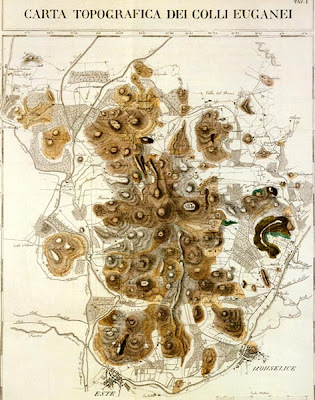 It’s actually a volcanic region that initially was completely submerged, then was an archipelago, and finally a hilly region as the entire regional “plate” rose and emerged from the ocean in the Quaternary period, a time when recognizable humans existed. On a side note, the Quaternary period was a really interesting time geologically speaking. During this period, the Black Sea and the Baltic Sea switched from salt to fresh and back again to salt water because of flooding due to changes in the ground level around the area. The English Channel and the Bering Strait were also occasionally flooded (as we experience today) and dried up so that at some points there was a land bridge between Britain and European mainland and another land bridge connecting Asia and North America. Today these volcanic hills continue to be active, creating thermal hot springs and hot therapeutic mud. Despite the whole area being a regional park, there are many hotels and touristy sites nestled here and there amongst nature. It is also a great place of wine production, a denomination of controlled origin to be exact. That means that most, if not all, wine produced from this region will have a DOC stamp or indication on the bottle. This means that the wine not only comes from a special region in Italy, but that it also meets stringent requirements including: certain soil composition, standards of grape variety, and alcohol content, but most importantly that it is created following the historical and culturally important process unique to the area. When you drink a DOC wine, you are drinking what the families of that region have been drinking for many, many regions. That glass of wine was created the same way now as it was generations ago. In some way you are helping to preserve the unique culture of that region. While the DOC Euganei wine was on our list of things to explore this Sunday, we first wanted to work off some of the calories we stored up during our relatively uneventful summer. First, we headed to the Valsanzibio garden. This place is beautiful! 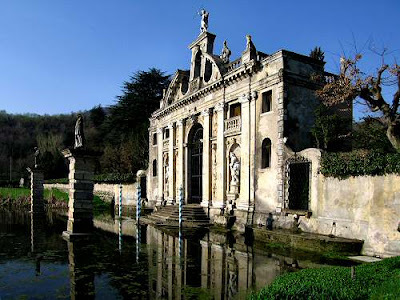 It’s supposedly named The Most Beautiful Garden in Italy, and quite possibly the oldest. Click on the underlined name, and it will direct you to their website for more pictures and information. Throughout Europe, there aren’t very many trees. Not old ones anyway. The whole European region was covered in trees long ago that today would be impressive for their size and beauty. Unfortunately the most of them have been cut down through the years to make way for farm land and cities. This garden had some of the biggest, oldest trees I have seen in Europe. It also had a lot of water features and a maze, all done in a classic Baroque style. I can’t believe that some young girl grew up with this as her entire world. I felt like I might almost be content to stay within the boundaries of my parents’ yard forever had I a garden like this. I must say now that Mateo is one of the worst people when it comes to directions. He can’t give them. He can’t follow them. He can’t read a map to save his life. I have a few embarrassing stories about him getting lost. (And he’s in Army!! How does that work out?) BUT, stick him in a maze and he can almost directly lead you the exit. It’s amazing! So while I might get a little angry and hopeless when we’re lost in Milan, I wouldn’t hesitate to have him as my navigational guide under weirder circumstances. Then we navigated through the rest of the garden, stopping off for a view of Rabbit Island, which houses lots of frisky rabbits and a large birdcage. The island symbolizes The Sphere of Immanence (yeah, I had to go look up that word, too) Then we went onward to the Villa, past a statue of time and playful fountains. Next, we decided to stop off in the town of Arqua Petrarca. 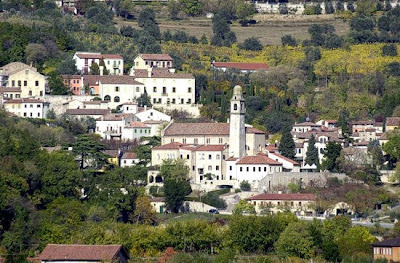 It is the place where the poet Petrarch (Francesco Petrarca) lived the final part of his life and died, hence the town's name. It’s a very small, beautiful, cobblestone-paved medieval town. While we appreciate poetry, we were most interested in trying a jujube. I had no idea that these dried, red olive looking things were Jujubes (also called red dates, apparently) until an old lady with a wooden roadside cart-stand insisted that Mateo and I try some. Amazing! Certainly not my favorite fruit, but I was happy to say I’ve tried a jujube. I’d pick a candy jujube or a “real” date any day over these things, but they’re quite popular in this town. Almost every house has a tree, and there were many, many products derived of the jujube to be sampled and bought. They had jujube cakes, liquor, candy, and a curious and somehow delightful jujube jello. We also rested our weary feet and satisfied our endlessly hungry stomachs in a small Osteria in the town. We ate sweet & sour sardines (typical dish of the Veneto region), pumpkin lasagna, a bean and faro soup, and baccala with polenta. I was surprised to see that the town had its own dialect, and the menu was written entirely in it…on a chalkboard… outside the restaurant… and nowhere else. I made frequent embarrassing trips outside to read over the menu and walk back inside repeating the word to myself a hundred times so as not to forget it and then forget it. We tried to finish up the night with mini golf, but got horribly lost. I couldn’t find my glasses anywhere. I only had my prescription sunglasses, so I was no help with street signs. It looked so easy on the map, but in reality, the streets are quite windy and confusing. Of course, country roads rarely are labeled anyway. So, after some minutes of frustration we gave up on the idea and headed home. “I’m thirsty. Quite thirsty,” Mateo said. So we stopped at the nearest bar: The Blues Brother’s Café. I grabbed my purse and headed inside to realize a second too late that I still had my sunglasses on… at 9pm. And, I was walking into The Blues Brother’s Café. I’m sure they thought I was a total moron, trying to look “bluesy” with my sunglasses at night. How embarrassing and hilarious! Then I immediately panicked. Perhaps it was a self-preservation panic as I wanted to avoid sharing the next few hours with people who had caught me walking into a bar at night with sunglasses on. I heard an awful 90s dance track and a couple of men holding hands. This is a gay bar. I have no problem with gay bars. I spent quite a bit of time in them in Hollywood, but the terrible music and leather pants were going to be too much for me to handle at this point. I was wrong: stepping further inside I see that it was a completely heterosexual family establishment in the back and slightly more risqué out front. To our complete surprise, a simple “tall beer” order produced a Kwak on tap in front of us. It was quite amazing! It's hard to find good beer in Italy, the land of wine. 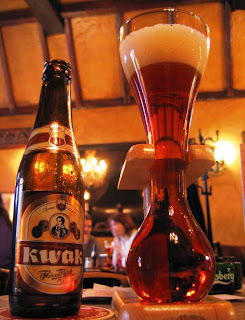 Kwak is a distinguished beer from Belgium, which is served in a fancy glass. After his beer and some water, Mateo was less than thirsty and we headed back home to promptly pass out and sleep through all of the next day.